Charles Downey Hardy Junior was born at Wagga in December 1898. Charles was the grandson of Charles Hardy, who founded the company that was responsible for many major civic buildings and private dwellings in Wagga. Charles' father, Charles Hardy Senior, had inherited the building company of C. Hardy & Co., and Charles Hardy Junior joined the family business after leaving school. In 1915, Charles secured an apprenticeship in carpentry, but when World War I broke out, he enlisted as a sapper in the AIF, serving in the 1st Pioneer Battalion and 1st Field Company Australian Engineers. Remaining in London after the war, Hardy learned the trades of concrete engineering and draughting. In 1924, he travelled to the U.S.A. where he studied afforestation, timber-handling techniques and industrial relations. When Charles Hardy Senior died in 1934, Hardy Junior took over the family firm. Charles Hardy always took a keen interest in politics, and was an active advocate of social justice. During the Great Depression of the 1930s, he policed the fair distribution of rations from the Wagga Benevolent Society. In April 1930, in partnership with H.J. Chaston, he organised a Necessity Drive collecting and distributing money, food, blankets, clothes and groceries to Wagga's needy. 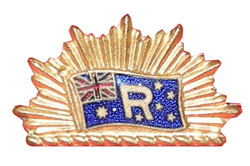 Prior to 1931, Hardy was involved in the formation of two new pressure groups - an Employers' Federation (of which he was President) and The Riverina Development League (formed in 1927). Both groups aimed to promote the best interests of Wagga - the former urging people to shop locally, agitating for the construction of an aerodrome, abattoirs and teachers' training college in Wagga, and the latter aiming to create policies which would further the rapid development of the Riverina. Hardy took a leading role in the Riverina Movement, becoming leader in 1931. In 1934 Hardy stood as a United Country Party (UCP) candidate in the Federal Election. Winning a seat in the Senate, he served as UCP leader from 1915 - 1938. During World War II Hardy was seconded to the Department of Defence, and was killed in a tragic air accident at Coen, Queensland on 27 August 1941. Charles left behind his wife Alice and two sons, and memories of a political legacy which are still remembered today. The name "Riverina" was coined in a letter to the Melbourne Press in 1856 by the energetic separatist Dr. John Dunmore Lang. This movement had been active during the Victorian period, but became dormant in the 1880s with the decline of the river trade, and the extension of the railway system, which linked the Riverina with the rest of the state and the port of Sydney. The Riverina Movement became active again during the 1920s, and reached a crescendo of popularity in Wagga in the early 1930s, built upon allegations that Sydney-based politicians were ignoring the area. With the election of the Jack Lang Labor government, a local charismatic leader emerged - Charles Hardy Junior - who was able to unite the old squatter discontent with the newer soldier-settler, townspeople and working class anti-Sydney feelings. Organised along paramilitary lines the Movement at its height was able to field an unprecedented 10,000 members to a meeting in Wagga on 28 February 1931. The excitement culminated in what was known as "the great riverbank meeting" - for which Wagga business houses closed at 3.30 p.m., thus enabling both employers and their staff to attend. Presided over by E. Fenn Lusher, the movement was supported by some of the most prominent residents in Wagga - including the Smiths of Kyeamba, the Brunskills of Allonby and J.D. Norman of Oak Hill - to name but the tip of the iceberg. It was the charismatic Charles Hardy whom many had flocked to hear at the Wagga Secession Rally. Nicknamed the "Cromwell of the Riverina", all newspapers reported that Hardy was a born orator 'with the staccato phrasing the force of the fighter'. He appealed to the emotional as well as the logical qualities of his audience. 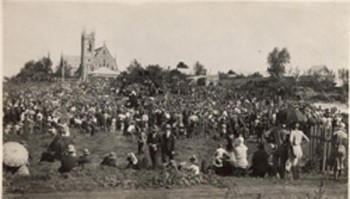 A week later 5000 attended a similar rally at Narrandera, carrying the same resolutions. In following months meetings were held at Deniliquin, Hay, Tocumwal and Jerilderie. The resolutions passed at the monster meeting were ignored by the Commonwealth government and only acknowledged by the State government. When Jack Lang was defeated in 1932, the economy began to recover and farmers, graziers and businessmen were no longer worried about protecting their interests, and the Riverina Movement fizzled out.